ORLANDO, Florida -- It has been hours since Mina Justice last heard from her 30-year-old son, Eddie, who was inside the Orlando nightclub when bullets rang out early Sunday morning. He texted her at 2:06 a.m., saying, "Mommy I love you." 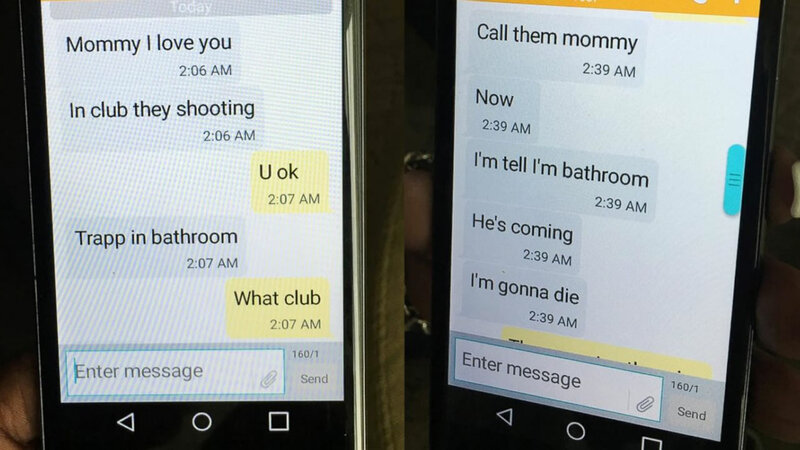 Eddie texted her again, saying there was a shooter at the club. He told her to call police and said he was hiding in a bathroom with other partygoers. "He's coming," he wrote. "I'm gonna die." "The next text said: 'He has us, and he's in here with us,'" Justice said in an interview with The Associated Press. "That was the last conversation." She hasn't heard from her son since. Click here for the full story on ABC News.